Introduction: PAN (Acrylic) Fibre is a kind of high performance synthetic fiber with special characteristics such as high modulus, good strength, crack resistance, anti-aging, anti-seepage, ultraviolet ray proof, antifreeze and thermostability to concrete, no environmental pollution. PAN (Acrylic) Fibre is mainly used for building materials, such as cement concrete and bitulith. As secondary reinforcement material, its real function and using prospect have been wildly understood and accepted in engineering. (1) Used in cement concrete, such as precast concrete panel, pavement, bridge floor, airport runway, anti-collision retaining wall, impounding reservoir, concrete face rockfill dam in hydropower engineering, waterproofing project, pumpcrete and so on. PAN (Acrylic) Fibre can not only increase the cement concrete’s strength, crack resistance, antifreeze, anti-seepage and durability, but can also reduce the cement concrete’s brittleness and can effectively suppress the crack extension. (2) Used in bitulith, such as the new asphalt pavement surface, old asphalt pavement, pavement patching, pavement cold repairing, cementation of fissures, deck pavement of steel structure and so on. Breif Introduction to our mill: Our mill is located in a beautiful environment city. According to the market demand, our mill , which is based on domestic well-known colleges and universities, is engaged in the fiber research and development and production. It has imported a full set of production lines and been equipped with advanced detection equipment. 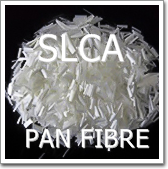 Its main varieties are PAN (Acrylic) Fibre normal strength and high strength. Its products have been wildly used in highway bridge, deepwater wharf, water diversion engineering, wall heat preservation and so on. Packing: in 25kgs PP bag, 440bag x 25kgs/bag = 11000kgs / 1x20'fcl.